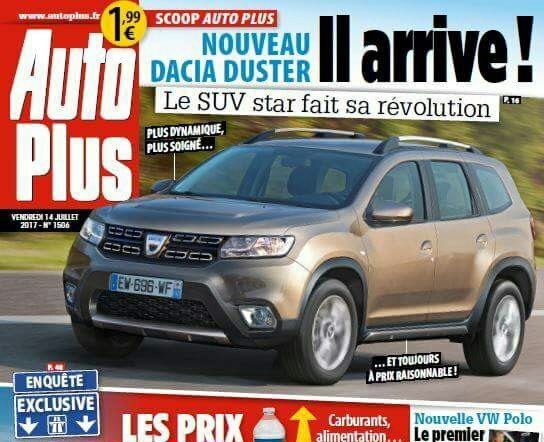 The French magazine Autoplus published the first real photo with the new Dacia Duster, about two months before the official launch. The new Duster will be available for orders in the first months of 2018. As we can see from this only image published by the French journalist, the new Duster has a more dynamic look with redesigned front lights and front grille. It seems like the new SUV from Dacia will use the same platform as the old models to maintain low production costs and low prices for all markets. The Duster 2018 could be bigger with a couple of centimeters so that it would be considered a real compact-SUV and maybe to allow a new model in the Dacia range. Next year we could also see the Grand Duster, the first seven-seater SUV from Dacia. According to some rumors, the new Duster will be powered by the same engines as today and the price should still be unbeatable. The cheapest version is supposed to have a starting price of 11,900 euros.